It was almost a year ago that I posted I was suffering from garden fever. It honestly makes me feel very manic. Fall and spring are really creative times for me, when I get very excited about EVERYTHING. I have a stack of interior design books, a pile of yardscaping guides, new music on the iPod, crude sketches everywhere . . . 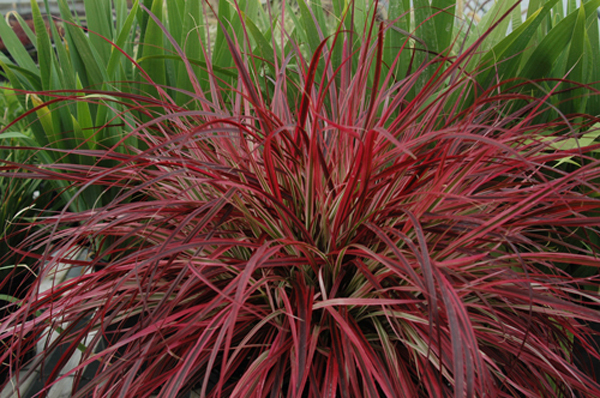 I catch myself bouncing in my seat when I catch wind of another plant sale. Everything feels full of possibility. I was flipping through a plant encyclopedia at lunch one day and I felt like I would just die if I didn't get a goatsbeard (Aruncus) under the conifer in the backyard. I called Marbott's after work and found out that they don't carry it and I was so sad. I didn't want to drive all the way out to Portland Nursery during rush hour, either. I saw this picture in this yardscape book of gas water heater flue baffles used in the garden and I. had. to. have. some. Do you know how freakishly hard it is to find those? Nary a hardware store in Portland (not even Wink's!) carries them, there weren't any at The Rebuilding Center, and the online stores that carry them (Sears, mainly) don't include the dimensions or a picture. Stymied again! That's why it makes me feel so much better when I hear from friends who are just as antsy to get out in the mud to start planting. And then I saw this, from A Way to Garden. "I garden because I can't help myself." On Being a Gardener: From "And I Shall Have Some Peace There" from Margaret Roach on Vimeo. That's exactly how I feel. I can't help myself--what am I going to do, just not garden? That's not an option. I honestly don't understand how people DON'T get excited by gardening. In other news, I think this mystery bush might be a dwarf Canadian hemlock. Maybe? Either way, I want to move it somewhere else. That's the bedroom off the deck there and I want something that smells good so the scent will waft in through the screen door that I'll have someday. Can someone drop a hint to the boy that a screen door would be an excellent birthday present? And one of these. WANT. Those flue baffles are so cool! 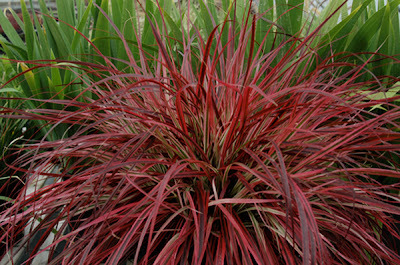 And O.M.B, that 'Fireworks' fountain grass is GORGEOUS! 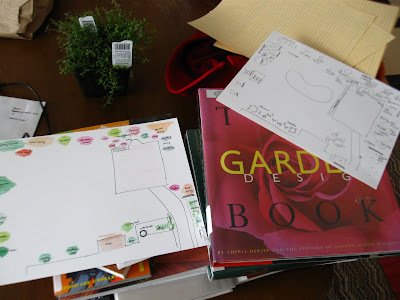 Wow, I can tell, you are really in the gardening and garden design fever! Sorry I can't help you much with what be good plants for you to plant. What might do good down here in Texas might not like the cooler temperatures in your area. But I agree, the willow would have to go if that was my garden. 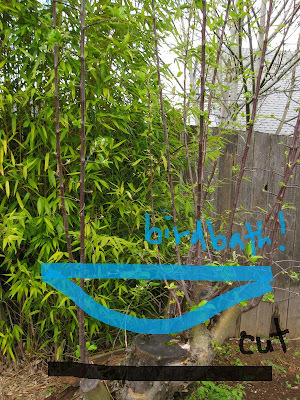 Using the tree stump as a base for a nice birdbath is a good idea. I have a cut tree stump placed in my rock bed and use it as stand for a flower pot. seriously. it hurts! I just wanna plant! Jess, you are one of those friends who make me feel better. :) If we have another spring like last year's I'm gonna cut someone.